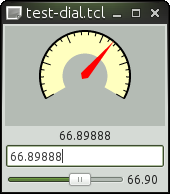 The existing dial widget is a straight implementation from the Gtk tutorial docs. Whilst it was possible to create an instance using the gnocl::dial command it wasn't much use. Apart from wiggling the mouse pointer around it didn't offer any way of setting or getting a value within a script, nor did it enable the user to set a variable trace. Added to this, the graphics were pretty grim as it relied upon gtk paint operations. Over the weekend I took a look at what could be done with the existing code. After a bit of work it offers much more. The graphics are rendered in Cairo and so look good and the displayed value can be set and retrieved. Not all the changes have been in the gnocl dial sources, some tweaking has taken place in the GtkDial.c source too. The next step is to provide some controls over the colouration of the widget, and setting the range limits much like those of the scale command.